View Gallery / 16 Copyright 2019 Nexstar Broadcasting, Inc. All rights reserved. This material may not be published, broadcast, rewritten, or redistributed. AUSTIN (KXAN) — There is an adorable new challenge that's sweeping the Texas law enforcement community and it's the most heartwarming thing you will see on the internet today. Officers, usually in uniform, are posing with the Texas state flower, often with a message. The messages range from anti-littering, safety while taking bluebonnet photos or exercise and meditation. 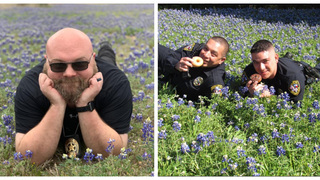 But sometimes, the officers just "felt cute." So far, officers from the Copperas Cove Police Department, Granite Shoals Police Department, Grapevine Police Department, Irving Police Department, Cedar Hill Police Department and several others have already participated in the challenge. An officer with the Farmers Branch Police Department had to improvise, posing with cartons of "Bluebonnet" butter. Law enforcement in Travis County, Williamson County, Hays County, Llano County and others in the area have not yet jumped on the bandwagon. But we hope they will!